FISHKILL - The Rombout Fire Company and its Ladies Auxiliary recently hosted a dinner for the members of the Firemen’s Home in Hudson. The 12 retired firefighters came to the Rombout Fire Department Station No. 1 in Fishkill, where Second Assistant Chief Wes Hall welcomed them and introduced the Rombout Chiefs, Line Officers, Commissioners and special guests. After the roast beef dinner, Firemen’s Home member and past Hughsonville Second Assistant Chief Walter Hall was honored for his 15 years of service. 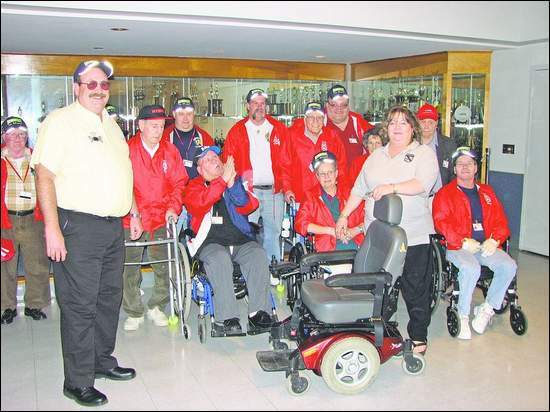 All Firemen’s Home members received a Rombout Fire Department hat embossed with the American flag. Members then enjoyed bingo, winning gift certificates from Wal-Mart. Rombout Ladies Auxiliary President Patty Lamoree presented four motorized wheelchairs to Fireman’s Home Trustee Paul O’Brien. For more than 100 years, the Firemen’s Home has been the only nursing facility in New York state devoted to caring for volunteer firefighters and their spouses, as well as members of ladies auxiliaries. Visit www.firemenshome.com.